Let us help your students take their next step toward God! Join us for Unite at all campuses on Sundays from 5:30-8:00 pm! Unite is our weekly Sunday night ministry at Forest Park for students grades 7-12. 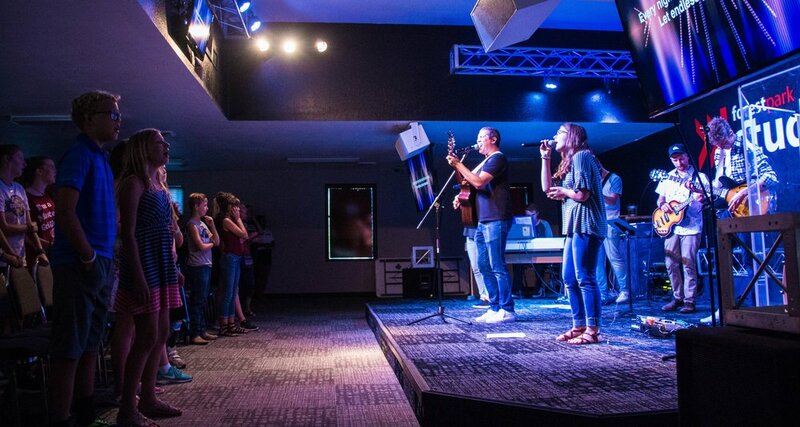 Unite is loaded with worship, friends, LifeGroups and a message geared toward students and their everyday lives. Our goal is to create an experience where students can meet Jesus and grow in their relationship with Him. Grow in your faith through service! We believe students are not only the leaders of tomorrow, but the leaders of today. Serving within the church is one of the best ways for students to make their faith their own. Through Student Impact, students can be the church and develop their leadership skills while serving in Kid City or on the First Impressions Team. Dive deeper into God's Word on Wednesdays from 6-8:00 pm! Trek and Journey are for students in grades 7-12 who want to memorize Scripture, study the Bible and develop the discipline of having a daily quiet time with God. At Centrifuge, students are divided into groups for recreation and Bible study based on age ranges by grade completed. Recreation is facilitated within Bible study groups by a member of our trained FUGE camp staff, who also leads the Bible study. Each activity serves a specific purpose and is debriefed so students can make application in their lives. Students also participate in Track Times. Track Times are created to give students the opportunity to participate in something with which they are familiar, or try something new! Students are divided into “tracks” based on a list of activities they indicate during the registration process. We offer creative, active, performance, and classroom-based activities during these times, and each track is led by a member of the FUGE staff. find our campuses on facebook!